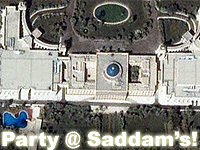 Female U.S. embassy staffers in bikinis were partying it up by the pool, karaoke singers were rocking and Halliburton subsidiary Kellogg, Brown & Root was serving up roast beef, pasta and crab dishes all at the Iraq Republican Palace, Soma reports from Baghdad. Saddam Hussein probably wouldn’t mind the scantily clad women running through his palace, although he might cringe at hearing American rock music. Soma, a newly minted newspaper out of Suleimanieh, had a few more insights to share, including the identity of the embassy guards. Soma launched recently as a bi-weekly “digest” of news from the Kurdish enclave and some from the rest of Iraq. Funded by Iraqi President Jalal Talabani‘s wife, Hiro Ibrahim Ahmad, the paper enjoys high-level access. In its latest issue, Soma revealed what really goes on at the Iraq Republican Palace inside the heavily fortified Green Zone. Some guards at the embassy were Peruvian, not American. The Halliburton subsidiary treats the embassy employees well. U.S. Foreign Service Officers starting out their career are eager to get the plush three-month assignment for career advancement. There is also poolside volleyball! Tuesdays are karaoke and bikini days at the temporary U.S. embassy. While the party is raging, U.S. troops are still taking bullets and getting injured. The State Department-hosted pool party seems insensitive to the coalition soldiers who are helping them enjoy Halliburton food and embassy staffers in bikinis inside the comfort of the Green Zone.